It sounds like a paradox: a going-out-of-business story, but it's also a success story. By pretty much all measures, the story of Woodburn's Wallace Video shakes out that way. Owner Tim Wallace announced last week that after 38 years the business he's closing its doors for good on May 31. 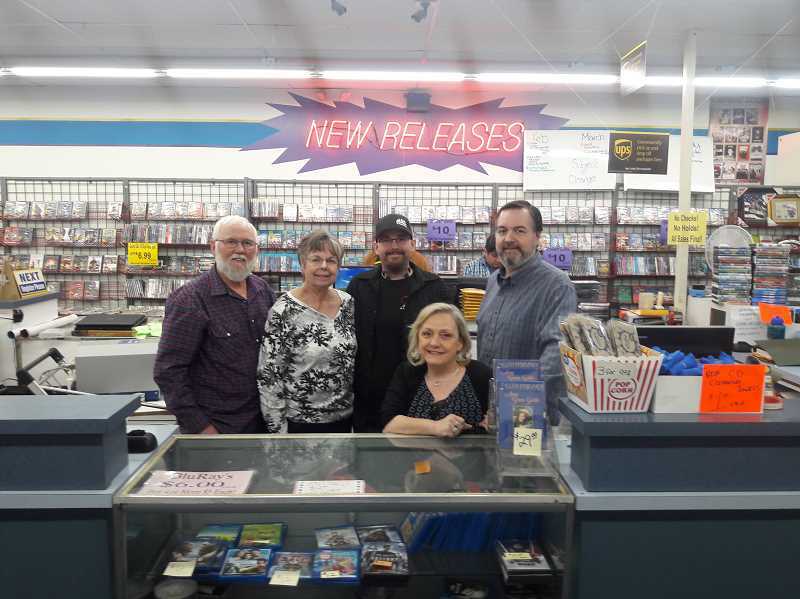 The business opened in Molalla in 1981 and 30 years ago moved to its current location, tucked in between Papa Murphy's Pizza and Do it Best GW Hardware, not far from where Highway 99E meets Mount Hood Ave./Molalla Road. The ubiquitous and growing world of streaming finally outpaced Wallace's forte – but not before he outlasted once video heavyweights Blockbuster and Hollywood Video, which at one point over the past four decades seemed to be trying to squeeze him out. "There was a Blockbuster right across the street, and a Hollywood Video 50 feet behind us," Wallace recalled. "A lot of competition has opened up and shut down over the 30 years since we've been here in Woodburn." Indeed, some recent hype has resulted in national news stories extolling Bend's Blockbuster as the last one remaining in the world. 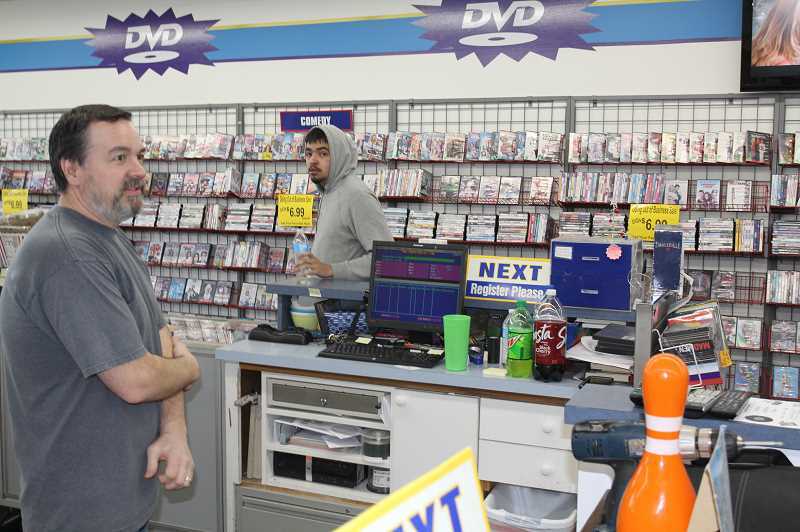 That store became a Blockbuster franchise in 2000 – a full 19 years after the Wallace's first opened shop. "Not many people can say they've been in the video business 38 years," Wallace said. Tim Wallace's parents, Tom and Linda Wallace, ventured out in their new business in Molalla with modest expectations. Tom was working at an auto-parts dealer, and Linda with a clothing manufacturer. The couple purchased 50 beta and 100 VHS videotapes and opened up for rentals. "Mom brought her rocking chair down to the (rental store) so she would have something to do when she wasn't busy," Tim Wallace recalled. "She never got a chance to sit in it." Then a 14-year-old freshman at Molalla High School, Wallace realized his parents' venture meant he had a job. He came to work to help, and stuck with it. When his parents retired after 20 years, he and his wife, Tina, took over the business, and their son, Brandon, also worked in the store. Wallace said he had hoped to make it a four-decade deal, so he could at least eclipse his parents' span, but his folks reminded him that's he's been with the store – and probably in the video-rental business – longer than anyone. Not long after Wallace took ownership of the family business on Jan. 1, 2000, he was feeling some heat from Blockbuster and Hollywood types. He surmised they opened close to him so they could siphon some of his business, then maybe take it all when he closed. He stayed solvent by taking up a second job, moonlighting as a security guard. "The hardest part was keeping the health insurance going; payments were $1,000 a month," he said. But his perseverance, a knack for knowing what local customers wanted and an initiative to get it for them, ultimately overturned hard times back toward his favor. He doesn't know if it was due to a consuming greed or merely a lack of foresight, but Blockbuster and Hollywood kept building and growing nationally, then collapsed under the weight of that growth. The Woodburn franchises went down with the chain. "They were competing against each other, and they built themselves out of business," Wallace said. "If they had not done that, we would not still be here." 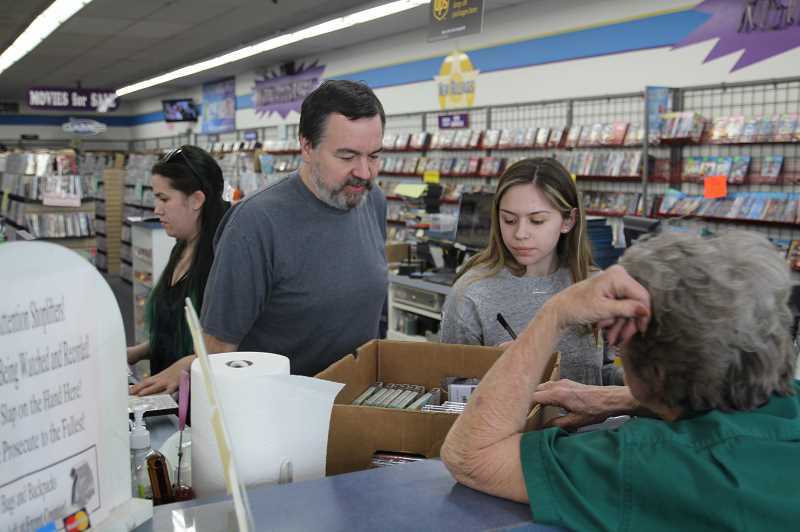 The local Blockbuster closed up, Hollywood followed suit, and in a twist of fate, the locally owned mom-and-pop shop was buoyed by new local customers left behind by the national chains' demise. But one advantage the locally raised businessman had was a knowledge of, and acquaintance with, his clientele. "I think we had more hands-on customer service," Wallace said. "If someone wanted a movie, I got it for them. I think I was a pretty good picker and chooser of what would be popular…and I had some luck." When Netflix, Hulu and other streaming options came along, they flowed into the arena fairly fluently. There were still limitations; customers of the streaming entities remained confined to what the particular service offered. "I had that corner of the market, what streaming didn't fill," Wallace said. "But obviously it's not enough to keep it going." A weightier influence than just streaming itself is that large movie makers, such as Disney, are now gearing toward undertaking their own streaming. As this trend gains more traction, it means the movie makers not only provide the production end of their business, but they assume the retail portion as well. Wallace itemized a number of traditional movie brands jumping into the streamer game – Amazon, Netflix, Disney, etc. – and noted that consumers will have to subscribe to each to fill their varied plates. "It's like now we are back to the frigging cable TV," he said. One thing big chains nor the streaming can displace is the memories. Wallace received a huge awakening to that when he announced his store closure on Facebook, then posted another request for people to share memories. "With a Heavy Heart, We have decided to Close the Business. The Availability of movies, no more movie posters and all the new streaming services have made it hard to stay open. It's been a good run (38 years!) We will be Open for movie sales until May 31st. SALE STARTS 3/19. So come on in pickup some of your favorites!" The response was profuse: more than 300 responses, 154 comments and 229 shares inside the next 40 hours. The next morning he posted a thank you to the community and invited people to share memories. That elicited another 121 reactions, 35 comments and 10 shares inside 24 hours. Andy Halter: "Oh man. I remember calling as a kid to see if people had returned the NES game I wanted to rent. Riding my bike up to the store to pick out something to watch on a Friday night. And as always seeing that huge double VHS box of Gone With The Wind sitting on the top shelf." Holly Grace Anne Brubaker: "When I was younger my dad would play card games with my siblings and I. We would make little bets like, if he won then we would give him foot rubs, if we won we would get to go rent a movie at Wallace Video and have root beer floats. This was over 20 years ago, and it's been such an honor to be able to bring my own children in. The store reminded me of simpler times. We will miss you all!" Bridgette Villarreal: "Before life became an extreme medical roller coaster for our family, we had a weekly routine of ordering Papa Murphy's then heading next door to get 5/$5 movies for the weekend. The kids each got to pick a movie they wanted to see. It worked out perfectly so there was no fighting over taking turns for choosing the movie. One child picked the same movie EVERY WEEK, while others took their time perusing the titles. When I wanted to be nostalgic, Tim ordered the film I desperately wanted to share with my kiddos. When we lost it for a year, no sweat! $10 and he ordered a replacement for the store! All of us bragged to our friends how great Wallace Video is and how lucky we were to have them. When I read to them the post yesterday about closing, everyone was upset. Thank you for giving us such fond memories and always being so cool about our "extra rental fees," because we were always late returning." When going out of business leaves a wake of so many memories, it's safe to say that business was a success.